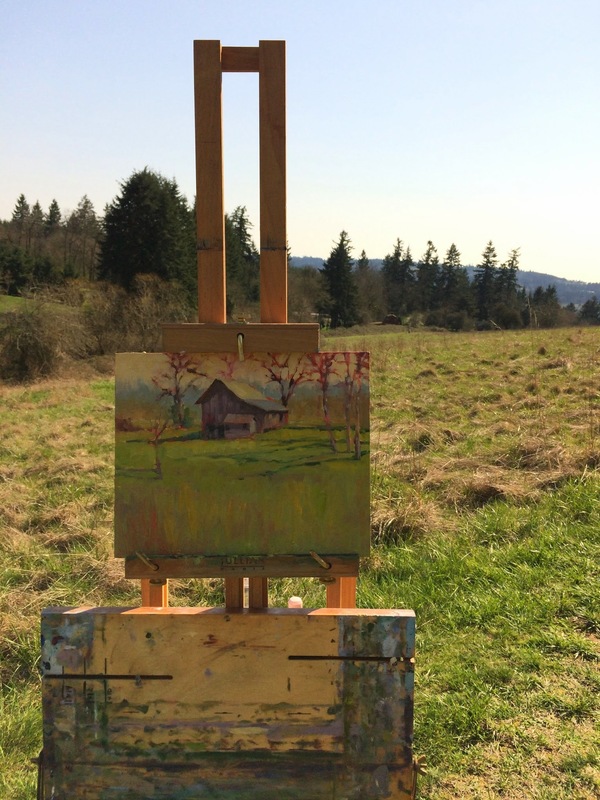 Today I met some friends at Cook’s Butte in Lake Oswego for some painting. What an incredible day it was! Today was one of those day’s that we’re soooo very glad to live in Oregon. The trees were just magnificent; true majesty and a feast for the eye. I really didn’t give much attention to my painting to be honest, I was completely distracted by the sun, the breeze the overwhelming visual display before me. 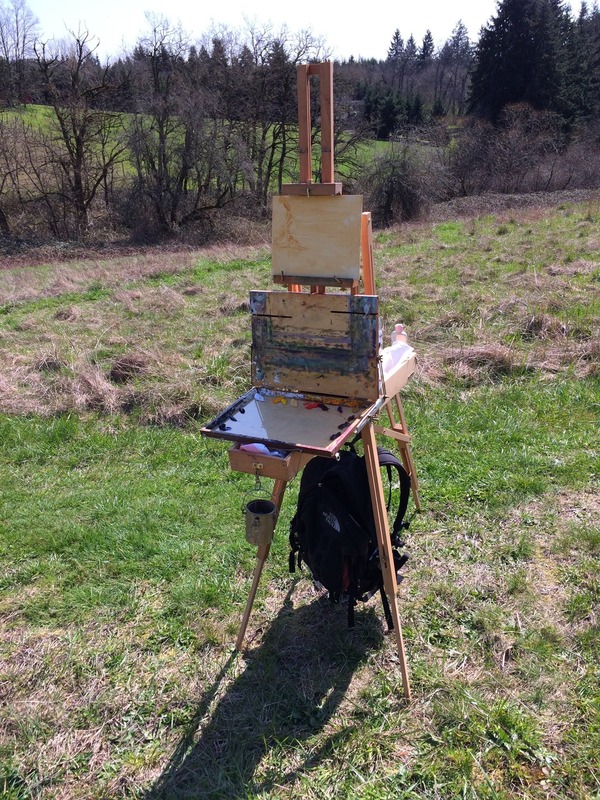 So, I sort of dove into my piece with no planning whatsoever, which wasn’t too very wise given that this was my first plein air painting outing in months. I ended up with the my composition being very centered and my barn being too big. I wanted the trees to have more dominance and height because they were primarily what I was interested in. All that being said, I didn’t care too much. I was so enjoying simply being outdoors, mixing the colors, smelling the paint, the trees, the grass. The fact that my painting wasn’t all that it might have been was really fine. So sweet was the day….One of my friends painted nearby. He got totally frustrated with his painting to the point were expletives were flying, brushes were thrown to the ground. I was laughing! Finally after a cool down, he asked me to work on it. Reluctant to put on my teacher hat, I spent just a couple minutes simplifying shapes and adjusting values, all with a big smile on my face and my music pouring into my head. His painting was still a mess, when I packed up and headed home. I needed to call it a day on the early side. This evening I received a message from my friend with a pic of the BEAUTIFUL piece that he’d transformed his F*@!IN painting into. Wow. So nice. Just goes to show what a little refocus can do for you. The other email I received this evening as a result of the painting day was from Rick. He’d stopped by to chat with us. Telling us that he owned the property the barn I was painting sat on and he liked to come over and take pictures of us whenever he happened to see painters capturing the barn. He was charming! So, lackluster painting aside, it was a fantastic day. I’m excited for much more of the same in the coming months!